Sports, for all intents and purposes, has consistently been somewhat of a “Boys Club.” And the saying “boys don’t cry” goes together with that. Weeping, or the actual symptom of almost any emotion in young men and lads has always been known as an instance of how not to be masculine, or worse, constantly been credited to female characteristics. Jason Wilson understands the defects in this school of thinking. 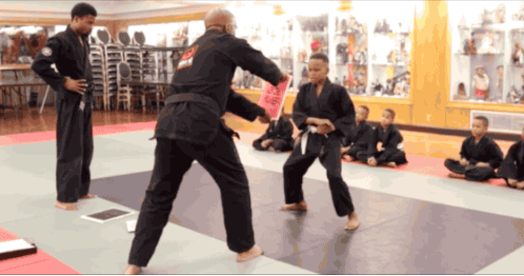 Wilson, the creator of The Cave of Adullam in Detroit, an association that educates a hybrid type of Martial Arts and meditation called Musar Ru, was lately noticed for coping with a scenario where a young lad was brought to tears. Bruce, a 9-year old pupil, discovered himself weeping when he couldn’t strike through a section of wood after multiple efforts. Bruce starts to weep after another unsuccessful effort, at which point the lesson is paused by Wilson. He gets down on one knee, and starts to get through to the lad. His Actions and words have caused this video counting and racking up almost a million views. “That ’s what this is about son. It’s OK to weep,” Wilson says in the video. Wilson wants Bruce to move forward, and therefore, have the ability to overcome his emotions, understand them and reason behind them. Therefore, this is the purpose of the martial arts and meditation combination, to help individuals achieve exactly this. It’s Wilson’s belief that men and boys can and should weep. Men should have the ability to manage any challenge in their way after digesting and comprehending their emotions. Bruce is eventually able to break through, and actively listens to what he’s being told. The video finishes with Bruce’s own dad being trained by Wilson – a moving case of dad and son learning collectively. Wilson agrees that we are facing a generation of sons who were fathered by men who were given by their dads a bogus sense of manliness. For him, it is critical that the men of his generation, do not let the new generation of boys grow up in the way many of them did. Hence, martial arts and meditation may work quite well. Wilson school of teaching will continue to grow and propagate this message.